No. 4 Brookfield Road is a lovely spacious semi-detached three-storey period house located on the east side of Brookfield Road near to Victoria Park in a conservation area. 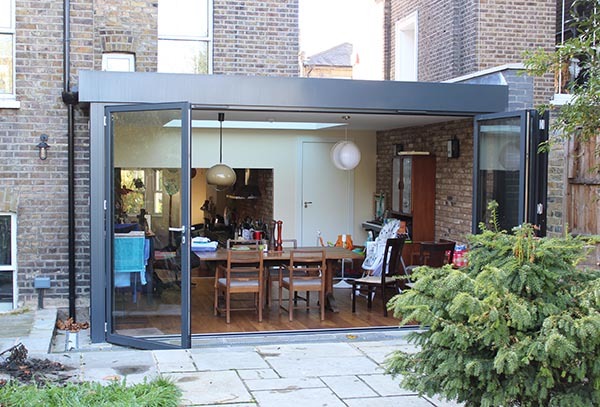 This project removed an existing rear conservatory that was only usable for short periods of the year depending on the weather. It was not well connected to the rest of the house due to a narrow entrance and steps, and blocked daylight entering the lower ground floor level from the rear and views out into the garden. 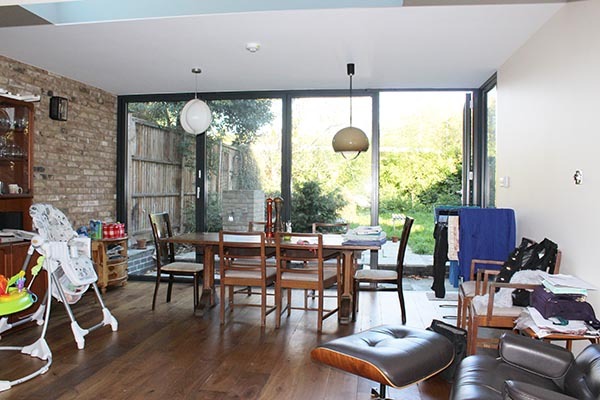 The proposal replaced the conservatory with an open plan glazed extension open to the lower ground floor kitchen space, easily accessible and far better integrated with the main house, and providing good access to the rear garden. The lower ground floor space was also opened up to provide a large kitchen/dining/living family space more suited to the occupants needs and modern demands. 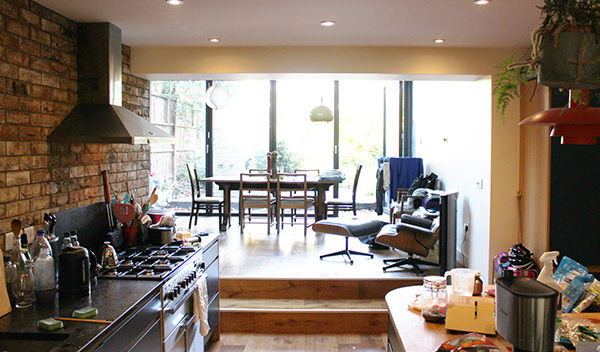 To maximise daylight into the kitchen and lower ground floor, the existing kitchen rear wall was opened up to the new extension. A large rooflight located near to the new opening to the kitchen, and the fully glazed rear elevation of the new extension, provides good levels of daylight into the existing kitchen and lower ground floor and provide clear views out into the garden. 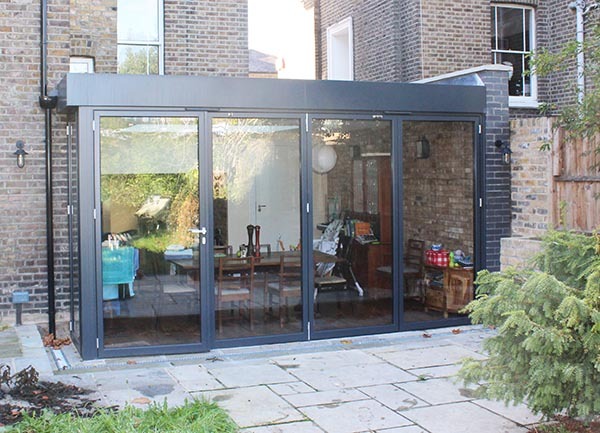 Full height sliding glazed doors provide views out into the garden, good levels of daylight, and open up during the warmer time of the year. 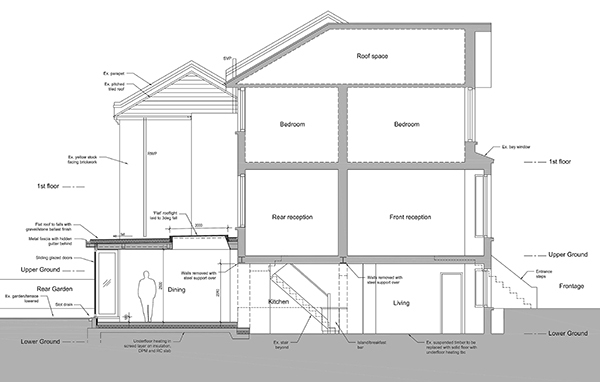 The floor level of the new extension is set between the kitchen and garden levels and the steps between located for ease of use and to improve accessibility around the lower ground floor and out into the garden.